As interesting as the subject matter of this film may be, it’s what we refer to as “Oscar bait.” It is a biographical film about someone from classic Hollywood. It’s exactly the sort of film that appeals directly to the members of the Academy voting on the awards. Yet even they only managed to find one aspect of the film worth nominating. That is either to say this subject has been beaten to death by now, or it simply indicts classic Hollywood for the blacklist scandal that went on for far too long. Either way it’s an ugly piece of history that this film doesn’t quite do due justice to. As someone who loves classic films, I was, nevertheless, interested in this story. I was even more interested after Bryan Cranston started gaining awards buzz for his performance as Dalton Trumbo, who was blacklisted by Hollywood for his affiliation with the communist party. Yet the film misses an opportunity to play up the idea that public opinion seems to hold as much authority as any law. Public opinion has only gained more significance in today’s internet obsessed society and opinion as news, news coverage. Guilty in the court of public opinion can ruins lives even if not guilty in a court of law. To an extent you need to be familiar with, or at least fascinated by, film history in order to be interested in this film to begin with. And yet that’s where the film gets itself into a bit of trouble. I struggled throughout to get around the fact that some of the actors portraying classic movie stars neither looked nor sounded a bit like the people they’re portraying. Perhaps they embody the spirit of the people they’re portraying, but I was never convinced enough that I was able to separate the actors playing the parts and the parts they were attempting to play. That isn’t to say that Bryan Cranston’s performance isn’t as good as advertised, but it was particularly difficult seeing Michael Stuhlbarg as Edward G. Robinson, and David James Elliott as John Wayne. Neither of these actors resemble the actors they’re playing, and they most certainly don’t sound anything like them. In fact, if their names hadn’t been said repeatedly you wouldn’t know who they were supposed to be. However, Dean O'Gorman could very well make a living doing nothing but portraying Kirk Douglas. He looks the part and sounds the part, at least as close as anyone in the world likely could. 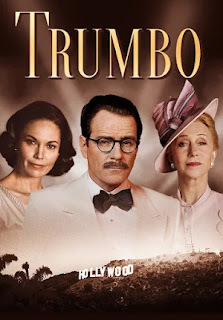 As far as the look of the film, there is a distinct difference in the parts of the film that represent Trumbo’s personal life and that which resembles old timey footage shot in courtrooms and for television. There is one particularly catching shot that begins in black and white, but as it zooms in to a close shot on Trumbo, the black and white fades into old timey technicolor as if to give us a sense of the different filming methods of the time this story takes place. Both are so convincing I wish the rest of the film had been done in similar fashion. Imagine a film pertaining to classic film that actually looked like a classic film. The story itself, however, is slow, long in the tooth, and doesn’t gain much momentum. The details, particularly the aging of the characters, seems to jump quickly without warning. The film releases (movies Trumbo wrote) are about the only way of keeping track of the timeline. John McNamara’s script (based on Bruce Cook’s book) splits its time between Trumbo’s familial struggles, particularly his relationship to his daughter, and his work that eventually leads to a breakthrough for blacklisted writers. After winning two Oscars for scripts written under a pseudonym, he soon finds big name Hollywood players, like Kirk Douglas and Otto Preminger, willing to stake the success of their films on publicly naming Dalton Trumbo as the screenwriter behind their latest projects. The success, and more importantly acceptance, of these films finally makes it possible for blacklisted writers to work again. Neither this primary storyline, nor the relationship between Trumbo and his daughter, seems to gain enough momentum to hit with the impact the film so clearly desired. But Trumbo’s interactions with his daughter throughout the film seem a clear setup for the clip played during the credits (the full video is posted below). It successfully appeals to our emotions more directly, even if the film fails to connect it to Trumbo’s primary line of action. Plenty of people have taken issue with the film’s politics or the historical accuracy (or perhaps how comprehensive it is) of what’s portrayed here, but the film has enough other issues that the politics (always my least favorite topic of discussion) are the least of the worries here. There’s a conversation between Dalton Trumbo and Otto Preminger in which Preminger asks Trumbo to rewrite the script for 1960’s “Exodus” claiming, “it simply lacks genius.” Trumbo replies, “Otto, if every scene is brilliant, your film is going to be utterly monotonous.” To which Preminger replies, “Tell you what, you write every scene brilliantly, and I’ll direct unevenly.” It would seem there was a similar but opposite agreement made between writer John McNamara and director Jay Roach. Either way this film lacks genius, and still manages to feel utterly monotonous. Though I'm willing to give it the extra half star for the performances.